Lampeter, (Llanbedr Pont Steffan) often known as Llambed, is in Ceredigion at the confluence of the River Teifi and the smaller River Dulas (Afon Dulas). The Norman castle of Pont Steffan was destroyed in 1187 having been conquered by Owain Gwynedd and its remains are now part of the foundations and campus of University of Wales, Trinity St David. 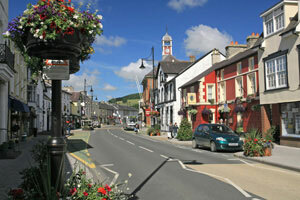 Lampeter is the smallest university town in both Wales and the UK. 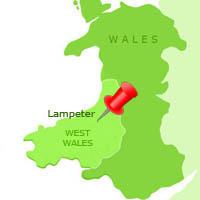 In the eighteenth century Lampeter was an important gathering place for drovers. Herds of livestock were gathered and walked all the way to the markets of southeast England. They established some of Wales' oldest banking institutions and the sign used by Lloyds bank today is in fact a Welsh mountain pony. The High Street has interesting architecture including the 18th Century coaching inn, the Black Lion. The Town Hall, designed by architect R J Withers and built between 1871 and 1872, now houses the Welsh Quilt Centre and Town Hall Café-Deli. The Jen Jones Welsh Quilt Centre celebrates and promotes a wider understanding of the importance of this regional art form. The gallery exhibits important quilt collections as well as related textiles and art; it also runs quilt-related courses and has a gallery shop. The adjoining café has a lively atmosphere and serves a selection of snacks and meals, often featuring local produce. Conti's café, now run by a fourth generation of the family, is famous for its delectable Italian icecream in a range of inventive flavours. You can also get great coffee, cakes and snacks there. There are 3 fish and chips shops in the town as well as a well-stocked health food store. Just along from the Town Hall, Calico Kate is an Aladdin’s cave of quilting supplies, fabrics, haberdashery and knitting yarns: a long established and popular shop in the town. 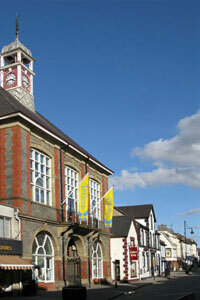 The Lampeter Museum is located in the Town Library, Market Street. It houses a small collection of items illustrating local history including the town’s original Royal Charter. The Romans mined gold near the town at Pumpsaint and the site is now managed by the National Trust as Dolaucothi Gold Mine. Guided tours of the mines offer visitors a glimpse of the workings below ground. The Romans established a camp at Pont Llanio and remains of the Roman road can be seen, although in many places it has formed the base for the modern one! There is some beautiful countryside scenery around the town and wonderful angling on the River Teifi. Dylan Thomas had links with Lampeter and nearby Talsarn. During WWII, he and Caitlin lived at Plas Gelli, just outside Talsarn. The Dylan Thomas Trail links Talsarn and Lampeter with other places in Ceredigion associated with the poet, such as Aberaeron and New Quay. The Lampeter Food Festival is held annually in July on the university campus - a really special setting which is sheltered and atmospheric. See more things to do in the Cambrian Mountains region. Looking for somewhere to stay in Lampeter? See holiday cottages in the Lampeter area.